The story continues with Peter and his Grandpa building more track and equipment for their railway. 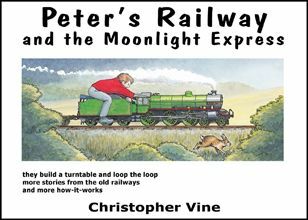 For Peter the great excitement of this book is learning to drive the engine, Fiery Fox. It is what he has been waiting for since they started to build the railway. Apart from one disastrous escapade, everything works as they intended. The story finishes with the railway running at night, taking Grandma to a surprise birthday dinner. The main projects are the building of a turntable at Gerald's Cross station and a loop of track at the far end of the line to turn the trains. More technical ideas are explored. Items covered are the boiler, pistons and cylinders, turntable, ball bearings, points and wheel arrangements. Hardback, 30 watercolour pictures. There are 14 pages of simple technical drawings to explain, add interest and answer questions.